Nature’s Sunshine Golden Seal/Parthenium Extract is formulated to help with those who struggle during seasonal changes by helping support the immune system. Golden seal contains hydrastine and berberine, two major alkaloids, and is often used with echinacea. Parthenium contains sesquiterpine esters. 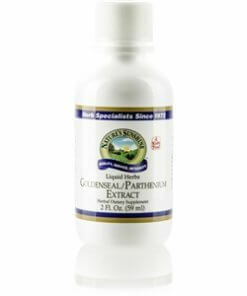 Nature’s Sunshine Golden Seal/Parthenium Extract is highly concentrated and rapidly absorbed by the body. 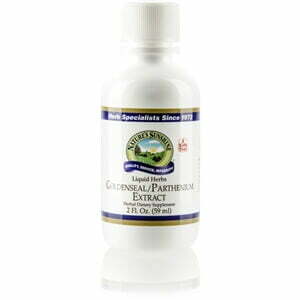 Golden Seal/Parthenium Extract can be taken in water or straight under the tongue. Instructions: Adults: Take approximately 20-25 drops (1 ml) twice daily with water. Children: Take approximately 10-15 drops (1/2 ml) twice daily with water. One ml is equal to one capsule of golden seal and one capsule of parthenium. A natural and pure extract of the finest golden seal root (Hydrastis canadensis) and parthenium root (Parthenium integrifolium) (with water and alcohol).